My path to becoming a runner has been quite the adventure. In the Fall of 2012, I moved to Tampa, Florida to begin my journey in the College Student Affairs program at the University of South Florida. During this time, I was facing a lot of transition and changes in my life. 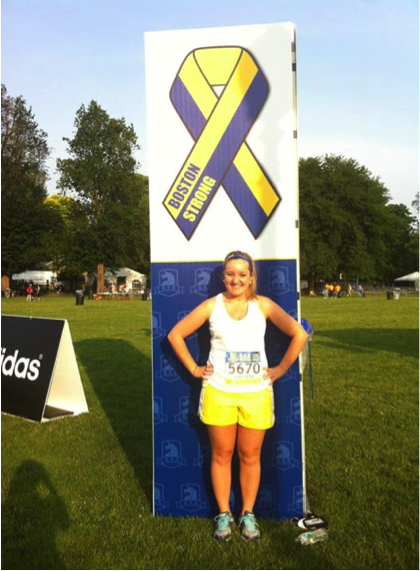 It was at that time that I needed an outlet and something to put my energy towards, and I found that through running. I signed up for running clubs, ran with my roommate and committed to running a race a month. Currently I am training for a half marathon in a month and then the Disney Glass Slipper Challenge this February where I will run a 10k one day and half marathon the second day. I am doing the challenge in support of one of my favorite causes, St. Jude Children’s Research Hospital, and have been fundraising along the way! Let me show you around the place that I began to call my own and that helped me on my running path. I start every one of my runs in my neighborhood. Located in South Tampa, I am in a great area! Within my reach, I have the bay, restaurants, shopping, coffee shops and more, all within walking distance. It is at this time that I want to thank my parents for giving me the opportunity to be able to live so far from home in a great location. Originally from New Jersey, moving down here was quite the project. I would not have been able to relocate and have this amazing experience without my parents. The next stop on my run was for a brief photo opportunity. It is the view from one of the bridges on Bayshore Boulevard. From here you can see the Tampa Bay Convention Center in the distance and Tampa General Hospital. For my next thank you, I made it a point to stop at the Gasparilla Pirate Boat on Bayshore Boulevard. Gasparilla is a pirate festival held in Tampa late January each year. 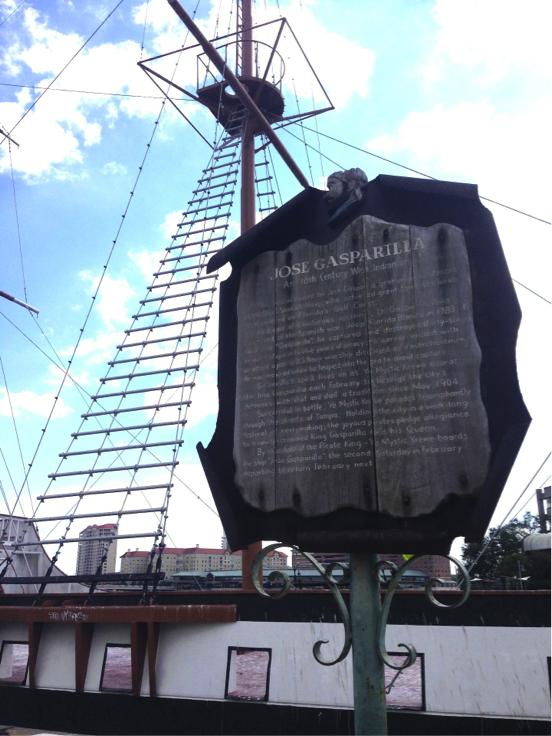 The history of Gasparilla is that pirate Jose Gaspar took over the city and madness ensued. On Gasparilla, large floats take over Bayshore Boulevard for a great parade. Everyone is dressed like pirates to watch the parade, and it is a great time. 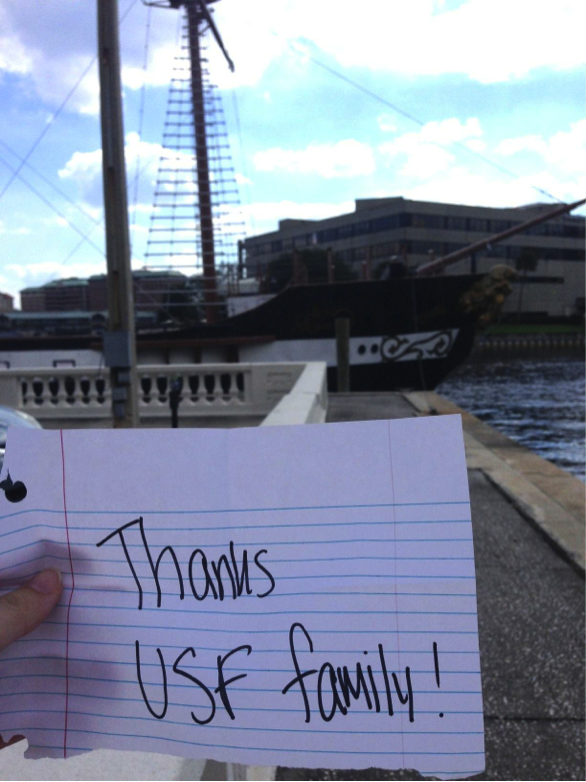 Here, I took the time to thank my USF family. I thought it was appropriate to stop here because this is something so unique to Tampa and something that I was a part of with some of my cohort members last year. My USF family, including my cohort members, co-workers, friends I made in Tampa, etc., have allowed me to learn from them, grow as a person and a professional and have really helped to make Tampa feel more like home. So thank you! My next stop was just a random spot along the bay. Sometimes, running on Bayshore makes you feel as if you can take on all. It is an easy run, little elevation and is beautiful. On today’s run, I even saw a few dolphins! On these runs, I reflect often and use it as a way to clear my mind. At this point, I would like to thank my George Mason University family. I graduated from GMU in May 2012, and I can honestly say that everyone there shaped me in some way, shape or form. I think about my friends, advisers, mentors and many others quite often, and I know that I wouldn’t be where I am today without them! 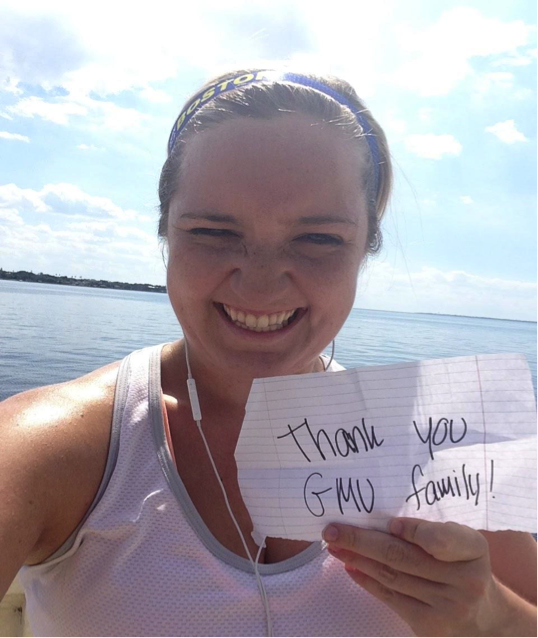 GMU shaped me into who I am today, and I would be wrong in not thanking them. I took this panorama of the bay to provide perspective of what the view is like on this run. Everyday, I notice something different about this location. 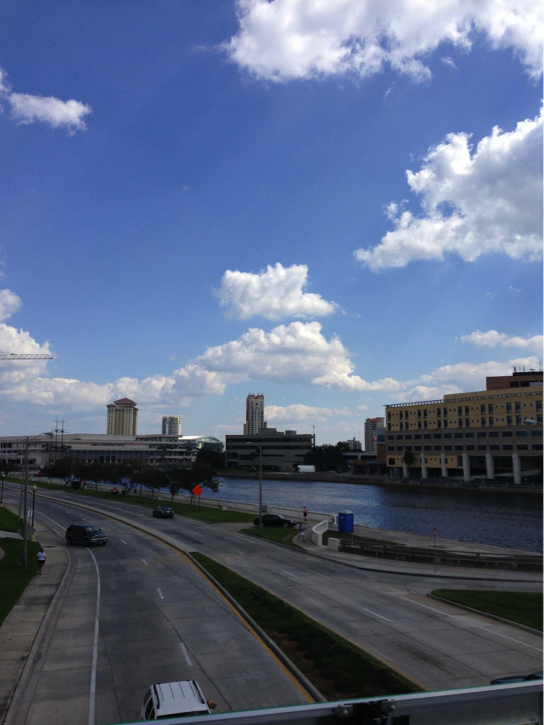 Bayshore Boulevard is the longest continuous sidewalk in the world, with a length of approximately 4.5 miles. No matter the time of the day, you can always find runners, walkers, bikers, families and more. After running on Bayshore, I reached South Howard Avenue. South Howard is lined with restaurants, bars, Starbucks and more. 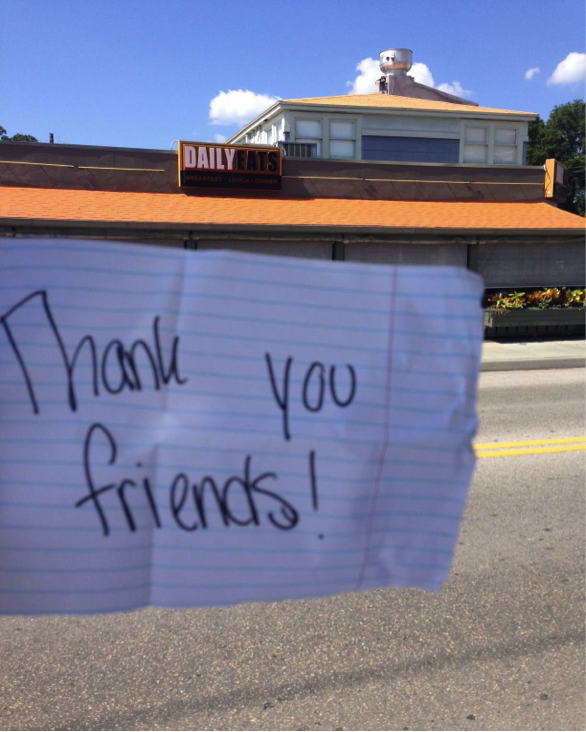 I made a point to stop in front of one of my favorite restaurants in South Tampa, Daily Eats. Daily Eats is awesome throughout the day, and they have a great brunch. They serve breakfast all day and have amazing tater tots, shredder bowls and more. If you are ever in Tampa, this is a great place to stop and grab a meal with a good friend. This is why I made it a point to stop and thank all of my friends here. Daily Eats is great for catching up on life, goals and great conversations with friends. I always make it a point to bring friends from out of town here. I truly am thankful for all of my friends, near and far. There are too many to name, but every one of my friends has given me something, whether it is a new way to look at something, support, a hug, a friend to run with, a person to listen or more, I am so thankful for all of my friends in my life! After this stop I headed home. 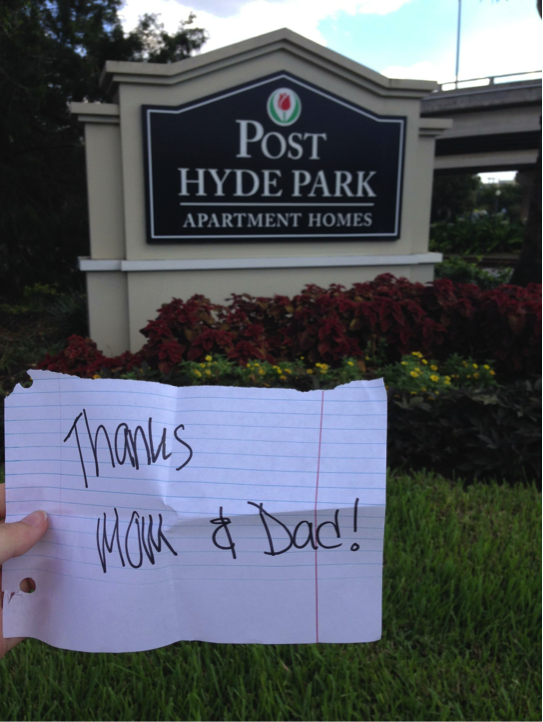 When I got home, I realized that I had forgotten to take a picture of one of my last thank you signs, so I did it at home…oops! This thank you is one of the most important. Thank you to Zeta Tau Alpha. Joining ZTA in Fall 2008 was one of the best decisions of my life and has really shaped a lot in my life. Through ZTA, I made lifelong friendships, gave back to our amazing philanthropy of breast cancer awareness and education and have been able to live and guide my life by the values of the organization. I take a picture of my thank you with my Disney Princess Half Marathon medal for a few different reasons. The first being that this was my first half marathon and one of the most difficult things that I have ever done. 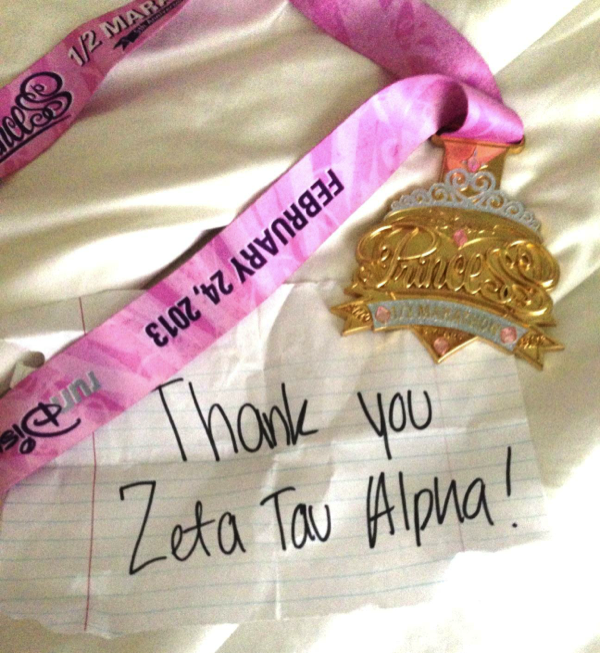 The support from my ZTA sisters really helped me cross that finish line. Also, in February, I will have the honor of running this race again with a few of my ZTA sisters, Amanda and Michelle. I want to take the time and thank all of you today for reading this post. Thank you to Steve Good for giving me this opportunity to reflect and express gratitude towards the ones I care about most through running! 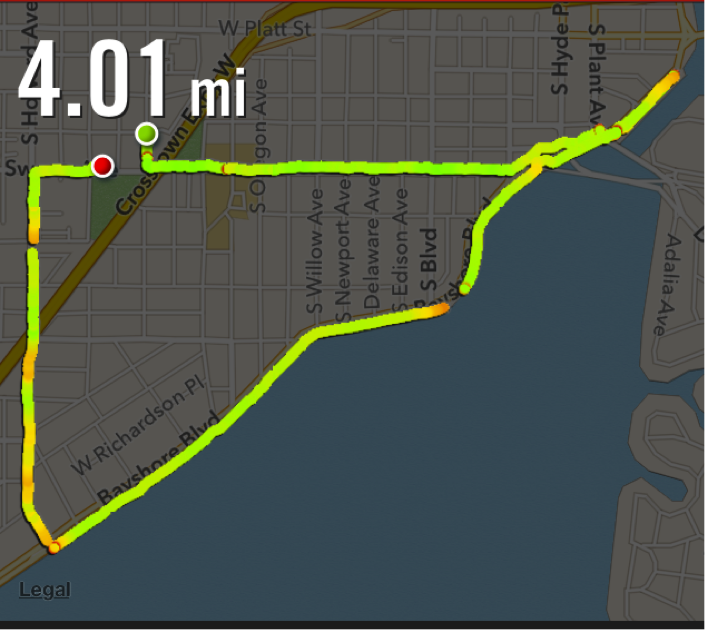 Hopefully you’ve enjoyed this four mile run around Tampa Bay!